Voted the safest child car seat in its class in independent tests, the Maxi-Cosi RodiFix AirProtect® is a real winner. Giving you peace of mind for every trip it’s designed with the latest safety technology. It fixes quickly and securely in place with your car’s IsoFix system. It has a padded seat for comfort on long trips. And it looks smart and modern to suit your car and lifestyle. Growing with your child, it will approximately last from the age of 3½ years until 12 years old. 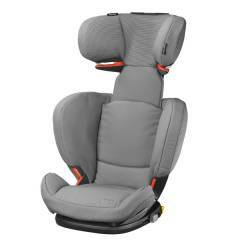 A group 2/3 car seat, the RodiFix AirProtect® uses your car’s three point seat belt to hold your child securely. 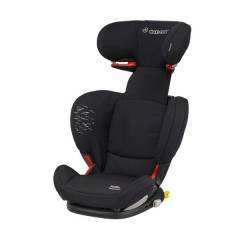 Easy-glide guides hold the seat belt at the right height across your child’s chest for quick and accurate positioning. The headrest has patented AirProtect® side impact protection to reduce the risk of head injury in side-on collisions. This uses a special foam, which deflates on impact to absorb the forces of the collision, lessening the severity of damage. The seat has also been specially shaped to help protect your child’s hips and back from side impact. The Maxi-Cosi RodiFix AirProtect® grows with your child so it always fits perfectly for optimum safety. Its headrest raises upwards quickly and effortlessly using a catch at the top. This makes it easy to ensure your child’s head is shielded and the seat belt is held correctly at every age. The sides of the Maxi-Cosi RodiFix AirProtect® can also be expanded for the best protection as your child grows. There are plenty of practical features too, like a removable, washable cover, which means it’s simple to keep your seat hygienically clean.